"The present is so important because through it the mysterious depth of the past and the mysterious breadth of the future reveal themselves through an encounter with one another". By chance I received a copy of Svetlana Alexievich’s ‘Secondhand Time’ recently and “haven’t been able to put it down”, as the saying goes. The author pieces together interviews and conversations with contemporary Russians so they sound like perfect spoken narratives. Every side of the Soviet story, before and after 1991 (annus mirabilis or horribilis depending on the speaker) is given space. Such is the dense detail and emotion of each chapter, one could easily miss the name Sergey Averintsev on page 22 of the Random House edition. 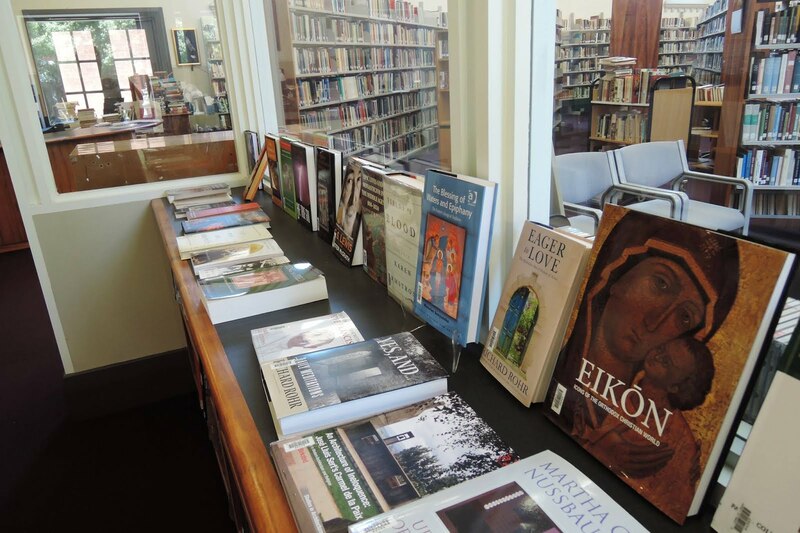 A librarian responsible for collecting Orthodox Spirituality will notice the footnote on that page: “Sergey Averintsev (1937-2004) was a philologist, cultural historian, translator, poet, and specialist on antiquity and Byzantine culture. He lectured on Russian spiritual traditions.” Alexievich’s book discloses that he worked in the Philology Faculty of Moscow State University. “Why had I not heard of him before?” as the saying goes. An Amazon search declared one book in English with his name attached. 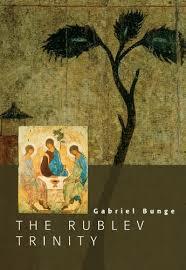 Blessedly, the Library already held this book (‘The Rublev Trinity’ by Gabriel Bunge, St. Vladimir’s Seminary Press, 2007); Averintsev wrote the foreword. And that’s it? Googling provided other reasons for taking this author very seriously. He has a department of Russian Studies named after him at Durham University. The homepage raised the stakes considerably. But who really was Sergei Averintsev? It would be easier to say who he was not. In the field of the humanities he was almost everything that a person can be: a philologist, a philosopher, a theologian, a cultural historian, a literary theorist, a translator, and a poet. He was a man of encyclopedic erudition that covered Greek and Roman antiquity, the New Testament, Middle East, Byzantium, European Middle Ages, classical Russian literature and philosophy, Russian Silver Age, and 20th c. Western literature and religious thought. He was a philosopher in the deepest dense, a seeker and lover of wisdom. As probably nobody in Russian humanities he interpreted cultural phenomena in multiplicity of their intertextual and interdisciplinary projections. He was a most broadly thinking humanist but with a very firm standing in humanistic and religious foundations of Russian and European culture. His thinking was opposed to totalitarianism of any kind, be it communism or fascism, religious fundamentalism or technocratic pragmatism. His credo was a combination of faith and freedom. He could repeat after St. Augustine: "Believe in God and do what you want". Averintsev was born in 1937, in the year when Stalin planned to exterminate completely religion in the USSR and tens of thousands of priests were killed and tens of thousands of churches destroyed or turned into warehouses. Averintsev has done more than any other Russian intellectual to restore the connection of our contemporaries with the spirituality of the past thus opening the way to the spirituality of the future. Since the late 1960s, with publication of his articles in the five volume Phiolosophical Encyclopedia and his book The Poetics of Early Byzantine Literature (1977), he established himself, as they say in Russia, as vlastitel' dum, the ruler of the minds of Russian intelligentsia. He reversed the relation between politics and culture in the minds of many intellectuals. Under Soviet regime, culture was believed to be a tool of politics. For Averintsev, politics was only one small segment of culture, inscribed in larger and spiritually more rich segments, such as literature and language, philosophy and theology. He can be considered, along with Mikhail Bakhtin, who belonged to a previous generation and whom Averintsev admired, a founder of Soviet and post–Soviet culturology, an integrative, multidisciplinary approach to culture. Averintsevian sayings became my abiding interest. In an interview with the translators Richard Pevear and Larissa Volokhonsky in The Millions online (2009) they say, “And there is the fine essayist and “culturologist” Sergei Averintsev, one of the most important Russian thinkers of recent times, a brilliant and witty writer. A few of his essays have been translated into English, but nothing like the substantial collections available in Italian, German, and French,” then add, “the French publisher Cerf has recently commissioned a translation of Averintsev’s complete works.” If there are no books by him in English, does the internet give glimpses of the thought of this vlastitel' dum? My searches found a few. I quote two of them here, but the search continues. From ‘Poetry, freedom, and revolution”, quoted in Questia online, Unesco courier. From an interview in Day Kiev magazine online, 13th November 2012. Have you ever noticed how the pages of an average book when opened are about the size of the human face? This is worth keeping in mind when pondering the news that all books could now be stored on a device the size of a postage stamp. 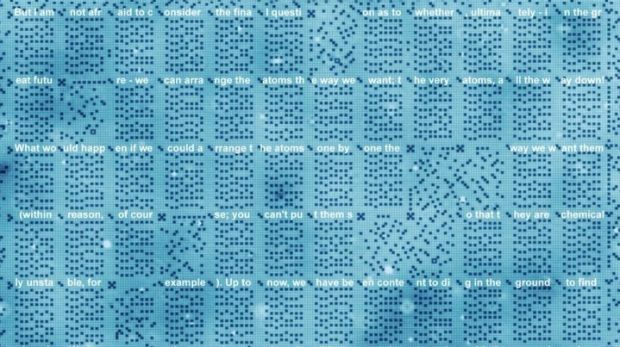 A team of scientists in the Netherlands have, through the manipulation of single atoms, made the world's smallest hard drive. It gives new meaning to the word netherlands. Without going into details of what they mean by “all the world's books”, the team claims the technology is “so dense” it could hold this quantity of book content. 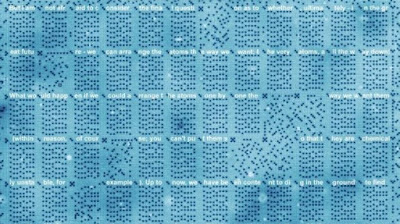 One professor at Delft University describes this invention as “an atomic-scale printing press.” Another gave a lecture, in which he asked “What would happen if we could arrange the atoms one by one the way we want them?” The University team even encoded this lecture in a grid 100 nanometres across, a hundredth the width of a human hair, and in appropriate Delft Blue. The fact that this postage stamp has to be kept at liquid nitrogen temperature (-196.15 degrees) does not tempt this reader, who prefers reading anything at a mild temperature of 21 degrees celsius, near a sunny window, on a lovely Spring morning, nowhere near a laboratory. That this microdot postage stamp is some kind of ultimate library, albeit virtually invisible to the naked eye, may leave librarians and readers alike asking, so what’s the point? The issue, it seems, is not the readability of a microdot but its capacity for storage and retrieval of information, all of it in binary form. We understand that bit, at least. While someone can retrieve the right kinds of atoms in the right order, then librarianship is entering a new phase. The material universe is mighty big. Vast, humungous, tremendous, super, ginormous and other synonyms strive to describe the mightily big. When people say, philosophically, we are only a speck in the universe they have imagined a similar planet to our own in a distant galaxy, then reached the obvious conclusion. If they’re a speck then we’re a speck. This merely materialistic conclusion about the situation of the universe is a fallacy. After all, we as persons are not specks, anymore than the Earth we inhabit is an infinitesimal postage stamp. It’s all we know, both its human scale and its extra-human dimensions. True, our bounds are horizons. Even on the Moon we can only see half the picture, but as persons, reading our book on a Spring morning, it’s as much as we’re going to know in this world. Which is why science can seem such a misguided adventure, planning to put all books on a postage stamp. It is we in our own space who will choose to read the pages we read, up close, with our best spectacles if needs be. The microdot library is incidental, storing all of that other stuff we may never get around to reading. 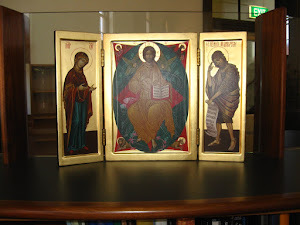 At the Creation Spirituality Symposium held at the Carmelite Centre in May Jan Morgan and Graeme Garrett introduced us to a practice of prayer they have been developing, in a session they called ‘Learning to Pray in the Anthropocene’. Find a place where you feel a sense of being in the presence of Nature. This may be by the ocean, in the desert, on a cliff top, in the mountains or the bush, in grasslands or wetlands, by a river, creek or pond. Chose somewhere you can go regularly, somewhere that calls to you, however faintly. For city-dwellers find a place that is as near to a ‘natural’ wild order, as relatively intact an ecosystem, as you can find. For example, a tract of bush remaining in parkland, or the re-vegetated edge of a local creek or pond. But it may be your own created garden, or even simply a single tree or a plant in a pot. Our circumstances differ, and change through time. The point is to find some connection with the wider living world of which we are part. You might imagine this as returning to the Garden, as an act of re-membering ourselves as part of Creation, or simply as seeing, hearing, smelling, tasting, touching and feeling the life-world of which we are part, the Ground of our Being from which we have been separated. We suggest you commit yourself to keeping the practice for 3 months. Like a growing plant this work is slow, organic, unfolding quietly. A half hour each day or even twice or once a week would be a way to start. If you already have a spiritual practice – meditation, contemplation, prayer, yoga, you will already know the value of a regular commitment. Consider re-allocating some of the time you already set aside. If a practice is a new idea, you may need just to plunge in. You may already be in love with the natural world, and spend time hiking, canoeing, surfing or walking or gardening. This is a different way to attend. The practice is done alone, but you might find a friend who would like to join you, either at the same place and time or separately. You could then agree to meet once a week and share stories and/or journals (see below). You also need to think about what we call ‘the weather’. Do you need to take a hat, sunscreen, rain jacket, umbrella, gloves etc? Other people may walk by. Decide ahead simply to attend to the practice. They have their life (and probably dog), you have yours. Once you have chosen a place consider how you will get there. Approach matters. Build in as much silence as you can. If you need to drive, turn off the radio or take some meditative music to play. Perhaps park some distance away so that you can walk in to the spot. If you do the practice in your own garden, consider a walk around the neighbourhood as preparation, and ensure that any other people in the house know not to disturb you (pray the baby stays asleep!). If you are in hospital, tell the nurses what you need. Having arrived, decide where to stand (listen to what is calling you). Take time to notice what you are hearing, seeing, tasting, feeling, smelling. Turn to honour each of the four directions (E, N, W, S), and feel the energy of the sun pouring down, and the energy of the earth rising beneath your feet. Dedicate the practice to the flourishing of all beings. Push upwards from the top of your head. jaw, place the tip of your tongue behind your front teeth, unlock your knees. Keep your eyes open. Soften your gaze – about a 45 degree angle is good. Empty your mind. Gently let distracting thoughts pass by as clouds across the sky, and return again to the practice. The occasional use of a prayer mantra (e.g., Maranatha; Lord have mercy) can be helpful. Are you willing to communicate with me? Wait in a receptive state for an answer, then if it seems right quietly ask . . .
Make an offering sending the energy of the practice back out into the world. Write about your experience (e.g. half a page). Keep these pages in a folder – you will be amazed at what you find when you read them later. We gratefully acknowledge teachings from a range of sacred traditions, in particular Taoist and Native American.